... and I was a little disappointed. I like the clones but the gear is black, I was really looking forward to having a bunch of matching clone but now I have gray and black gear. I also was really hoping they were pilots, eventhough I knew they were gunners. 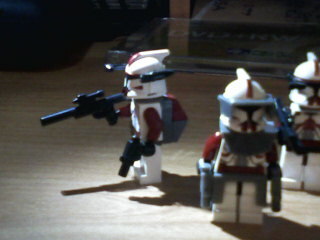 I think LEGo could have given us pilots so we could use them for our gunships, and other clone wars vehicles. Maybe it is just me but I could have used a bunch of pilots. Well, I for one dig the drivers. Need one for my AT-TE but yeah I hear you on the pilots cause everyone needs at least 2 for the Gunship. I hear you loud and clear. I am all for having pilots in the battle pack. They should have provided two pilots with the 7676 Republic "Attack" Gunship (Attack meaning it has no bubble turrets?). As they chose to give us Cody and a generic instead, I have chosen to use Phase II pilots (ARC170/V-wing minifigs) to "fly" my two displayed V-19 Torrents so I could place the pilots in one of my 7163 Republic Gunships. Finally, it looks like I have always wanted. My non-bubble turrets have Shock troopers and 41st Corps in the pilot seat. I would have liked so much to place clone pilots in them. But I don't have the $ to purchase heaps of V-19's or purchase the minifigs online. The gunners are a real pity. 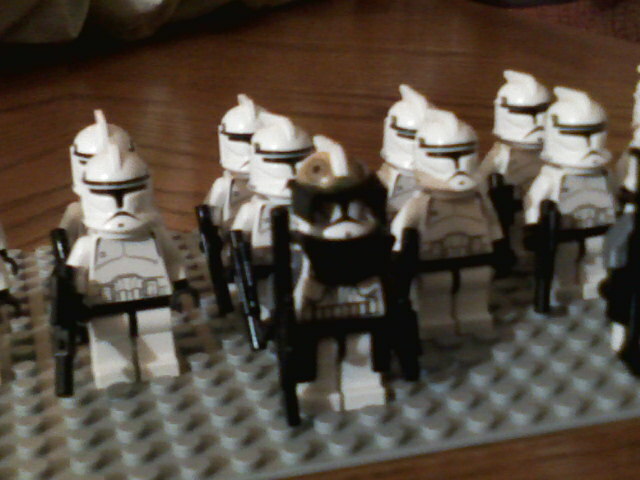 Like having Shats (Shadow troopers) in the Imperial Battle pack instead of Imperial pilots. Clone Pilots would have made the new BP's that much more popular. Like I'm sure the Commander Fox minifig made the Spider Droid a must have, a sold out item on S@H and a multiple purchase. Point of fact: it was labelled as an 'army builder' on the TRU price sticker at my local TRU! I am quite excited for the gunners actually. I think it will give variety and I always love new clone designs. However I fully agree with you all on the topic of the black ARC gear...It looks terrible and will contrast so much with the dark grey ARC gear Lego has already given us! The pauldrons in the movie and show are dark grey, hence the dark grey molds that we had before, but why do we suddenly have black? Differentiating plastic costs? I'm not sure...Maybe black is just cheaper to make than dark grey and Lego knew that the CBP's would be a top seller so they went with the cheaper route. Also, I'll be trying to find a good mod to the walker to make it more AT-RTish. Once I succeed, you can count on me to post the instructions for it, just like my other CBP mod. i would LOVE to get my hands on the new pack if they were available in stores in here Canada, Vancouver. Oh won't somebody call the waahmbulance. LEGO didn't tailor their sets to meet your exact needs or make identical representations of what was on screen. Heaven forbid that you should all have to use your imagination here. Granted the different coloured clone gear is somewhat of an annoyance, but do we really need a thread for this? but do we really need a thread for this? 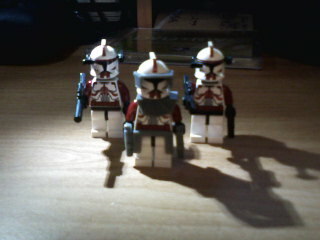 Do you know how hard it'll be for me to re-color it for my custom clones now?? I completely don't get this... I thought variety was a good thing. I thought variety was a good thing. More minifig variety = good. Black clone accessories = good. Movie/show accurateness aside, the dark bley ones look oddly out of place on clones, considering everything else is black or white; the black versions match. Perhaps it's because the look slightly transparent, but the original bley versions look cheaper and more like little pieces of plastic rather than part of the figure. Making them black maintains the look of everything belonging together better. Where did you get the battle packs? The new 09 sets have begun popping up in TRU stores. The battle packs can be bought on TRU's website right now however they're currently out of stock. I personally like the gunners. However, I do wish there was a way to get pilots cheap. I did not say I did not like the gunners I actually put full gear on them and one pistol and a rifle and thought they could be nice ARC troopers. I also was thinking they would work as pilots since you would not see their bodies. I like the gear black or grey just wish they were the same (might even like black better). Did not mean to sound like was complaining: just wondered if I was the only one who felt this way. well, as for me i dont own a gunship, or an AT-TE, but i am buying a bunch of battlepacks. i was very surprised the gunship didn't contain a pilot, not even 1! nor it didn't have a gunner either. However I would have a lower opinion of the gunship if it had come with a gunner. ya, for $120.00 USD, they should have given us i pilot, stupid budget cuts. and with the AT-TE they should have given us two clones instead of Anikan, and Asoka. Personnally, I like the new Clone Battle Packs (not that I own one yet). I missed the original AT-RT, so this BP will fill a niche that is currently empty. And the Phase I Clone Troopers will fit nicely in my RGS (and AT-TE, If I ever get one). My problem is with the Assassin Droid BP. The vehicle looks pretty cool, but do we really need 5 Assassin Droids? I can't see picking up more than one of these, unless I find the pieces indispensible for MOCs. I also don't understand why people are upset with the black gear. To me, it allows for more armor/ rank variations to spice up your army. I do not have these in hand yet, however. I saw them at TRU, but at $12.99 I'll wait until I find them for $9.99 at Target, Walmart, or Meijer. I did a full review of this in the Set Reviews section. And I think they need to re-release an actual battle droids bp. This time, with the straight arms and new blasters, and the super battle droids with the weapons arms (I didn't really mind the old ones, though--if you look close, the ends of their hands have blasters). I'm heading to TRU on either Friday or Saturday to pick up a bunch of small legos, clone bps and spider walkers and such. *Also* If you're like me and don't have any pilots yet, then the gunners would do in a pinch as not only pilots, but well, gunners.